1. What did Daniel see in vision in the third year of King Belshazzar’s reign? “[I saw] a ram which had two horns…, but one was higher than the other, and the higher one came up last. 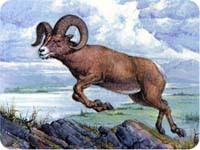 I saw the ram pushing westward, northward, and southward.… Suddenly a male goat came from the west … without touching the ground; and the goat had a notable horn between his eyes [and] attacked the ram, and broke his two horns … and trampled him. Therefore the male goat grew very great; but … the large horn was broken, and in place of it four notable ones came up” (Daniel 8:3-8). 2. Which empires do these animals represent? “The ram which you saw, having the two horns–they are the kings of Media and Persia. And the male goat is the kingdom of Greece. The large horn that is between its eyes is the first king. As for the broken horn and the four that stood up in its place, four kingdoms shall arise out of that nation, but not with its power” (Daniel 8:20-22). Using new symbols and more detail, the power struggle between Medo-Persia and Greece is replayed. The large horn is Alexander the Great; the four horns are the four divisions of his kingdom. 3. After this conflict was settled, what appeared on the scene? What did it do? 4. What significant exchange of information did Daniel overhear? One of the heavenly messengers asked, “‘How long will the vision be, concerning the daily sacrifices and the transgression of desolation, the giving of both the sanctuary and the host to be trampled underfoot?’ And he said to me, ‘For two thousand three hundred days; then the sanctuary shall be cleansed’” (Daniel 8:13-14). 5. What happened to Daniel as the angel Gabriel explained the vision? The 2,300 “evenings and mornings” (God’s reckoning of days starts at sundown; thus the expression “evening-morning” expresses a 24-hour day) overwhelmed Daniel. Gabriel understood, so he postponed explaining that part. Then Daniel “fainted and was sick for days” (Daniel 8:26-27). “In the first year of Darius … I, Daniel, understood by the books the number of the years specified by the word of the Lord given through Jeremiah the prophet, that He would accomplish seventy years in the desolations of Jerusalem. Then I set my face toward the Lord God to make request by prayer and supplications, with fasting, sackcloth, and ashes” (Daniel 9:1-3). As predicted, Medo-Persia had conquered Babylonia. Daniel was at the court of King Darius, the Mede, studying the writings of Jeremiah and searching for an understanding of the 2,300 days. He wondered, Would the seventy years of captivity for the Jews be prolonged? Daniel turned to God in humble prayer. 7. In response to Daniel’s prayer, God sent Gabriel again. What did the angel explain to him? “Seventy weeks are determined [translated from a Hebrew word that means to “cut off”; cut off from what? The 2,300 days] for your people … to make an end of sins, to make reconciliation … to bring in everlasting righteousness, to seal up vision and prophecy, and to anoint the Most Holy” (Daniel 9:24). The first seventy weeks of the 2,300 days were reserved for the Jews. Near the end of these seventy weeks, Jesus would come to give them a revelation of God. 8. When would the seventy weeks begin? “From the going forth of the command to restore and build Jerusalem until Messiah the Prince, there shall be seven weeks and sixty-two weeks” (Daniel 9:25). The Jewish captivity in Babylonia would end after seventy years, as prophesied. In B.C. 457, Artaxerxes restored civil power to the Jews, authorizing them to rebuild Jerusalem. At this time began the seventy weeks that would climax in the Messiah’s coming. 9. How many years are there from B.C. 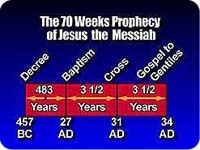 457 until the Messiah’s mission began? Based on the day-for-a-year principle (see Lesson 8), seventy weeks equals 490 literal years. (Seventy weeks times seven is equal to 490 days, or–a day for a year–490 years.) God had set aside 490 probationary years especially for the Jews. The Messiah would appear after sixty-nine weeks, or 483 years (seven weeks plus 62 weeks is 69 weeks, or 483 days, or years) to personally appeal to them to repent and become part of His everlasting kingdom. By adding 483 years to B.C. 457, we get A.D. 27, the year when Jesus was baptized and started His public ministry. Both Christ and the apostle Paul recognized His first coming as the “fulfillment of time.” Mark 1:14-15; Galatians 4:4. 10. That left only one more “week” for the Jews. What was to happen in the middle of that literal seven-year period? “After the sixty-two weeks Messiah shall be cut off, but not for Himself…. He shall confirm a covenant with many for one week; but in the middle of the week He shall bring an end to sacrifice and offering” (Daniel 9:26-27). Jesus’ public ministry lasted three and one-half years. In the middle of this seven-year “week,” in the spring of A.D. 31, He was crucified for the sins of the world. The top-to-bottom tearing, without hands, of the temple veil (Matthew 27:50-51) indicated the end of the sacrificial system, which represented what Christ had in reality accomplished–and still is accomplishing–for mankind. 11. To where did Jesus ascend a few weeks after His resurrection? “For Christ has not entered the holy places made with hands, which are copies of the true, but into heaven itself [note the title of the lesson], now to appear in the presence of God for us” (Hebrews 9:24). From earth, Jesus went “into heaven itself,” into the sanctuary there, the model for the one set up on earth to illustrate all that Christ had done and continues to do for this fallen earth. In heaven’s sanctuary, Jesus serves as our great High Priest. 12. What happened three and one-half years after the crucifixion, at the end of the 70 prophetic weeks set apart for the Jews? 13. When did the 2,300 years end, and what happened at that time? This brings us to the autumn of 1844, to the end of the longest of all Bible prophecies, Daniel 8:14, which tells us when the sanctuary is to be cleansed. The earthly sanctuary had long been destroyed, so the prophecy had to refer to an even more important sanctuary than the earthly; namely, the heavenly sanctuary. “Now this is the main point…. We have such a High Priest, who is seated at the right hand of the throne of the Majesty in the heavens, a Minister of the sanctuary and of the true tabernacle which the Lord erected, and not man” (Hebrews 8:1-2). 14. What does it mean to cleanse the sanctuary? How was this done in the earthly sanctuary? The word “cleanse” is translated from a word that primarily means “to justify.” When an Israelite sinned, he was to bring an animal to the sanctuary, confess his sin over its head, and kill it with his own hands. Leviticus 4. If the high priest or the entire congregation sinned, the priest would take some of the animal’s blood into the sanctuary and sprinkle it before the veil. Leviticus 4:3-7, 13-18. For a ruler or one of the common people, the priest would eat the flesh of the sacrifice. Leviticus 6:25-30; 7:1-7. In these ways the sin was transferred from the guilty sinner to the sanctuary. These sacrificial acts symbolized Christ’s future death on the cross for the forgiveness of sin. Once a year, on the day of atonement, in a very sacred service, the pollution of all the people’s sins was symbolically removed from the sanctuary. It was a very solemn time of judgment, because anyone who did not humble himself (come in a penitent manner) that day would perish. Leviticus 16:7-34. 15. How does this cleansing of the sanctuary apply to the prophecy of the 2,300 days? After Christ ascended to heaven, He went to the “true tabernacle,” the sanctuary in heaven, to officiate as the great High Priest, to pardon (by virtue of His own blood) the confessed sins of people. In the autumn of 1844, the period symbolized by the great day of atonement began. God the Judge began His review of all who have ever (1) accepted Christ as their Saviour, (2) confessed their sins, (3) received His pardon, and (4) secured His help to sanctify their hearts and lives. All who have accepted Jesus’ sacrifice and wholeheartedly confessed their sins will be forever pardoned and their sins blotted out before Jesus returns, for He said, “I am coming quickly, and My reward is with Me, to give to every one according to his work” (Revelation 22:12). 16. What kind of High Priest is Jesus? “For we do not have a High Priest who cannot sympathize with our weaknesses, but was in all points tempted as we are, yet without sin. Let us therefore come boldly to the throne of grace, that we may obtain mercy and find grace to help in time of need.” “He is also able to save to the uttermost those who come to God through Him, since He ever lives to make intercession for them” (Hebrews 4:15-16; 7:25). What about … THE HEAVENLY JUDGMENT? • What does this judgment mean to us? From Adam on, the life record of every person who has ever lived will–one by one–be reviewed. What is the criterion by which everyone will be judged, since everyone on earth is a sinner? “For God so loved the world that He gave His only begotten Son, that whoever believes in Him should not perish but have everlasting life” (John 3:16). The great question to be examined in each person’s life is, “What have you done with Jesus?” In other words, how have you and I shown our love for Him as well as for our fellow human beings? Has this love led us to obey His commandments? Matthew 25:31-46; Luke 6:46; John 14:15. This judgment will be concluded before Jesus comes. When the lives of all who have died believing in Jesus have been reviewed, the lives of the living will be next. We live in a very solemn time! Meanwhile, let’s find out what there is “Beyond This Life.” An underworld? Reincarnation? An immediate entrance into heaven or hell? Lesson 10 demystifies the grave itself, from the perspective of Adam and Eve to the parable of the rich man and Lazarus. 1. What was Gabriel about to explain when Daniel fainted? Who the little horn is. The 2,300 evenings and mornings. Which sanctuary is to be cleansed. 2. Who were given special opportunities during the seventy weeks? 3. What event marked the beginning of the seventieth week? 4. What happened in the middle of the seventieth week? 5. What two events happened in the autumn of A.D. 34 to mark the end of the seventy weeks? 6. What was the day of atonement? A very solemn day of judgment. The day the sins of the people were symbolically cleansed from the sanctuary. 7. What year and event marked the end of the 2,300 years? A.D. 1844, the beginning of the judgment. A.D. 34, the stoning of Stephen. 8. What started at the end of the 2,300 years? Another probation for the Jewish nation. Jesus’ final ministry–the blotting out of sins before He returns. “For we do not have a High Priest who cannot __________________ with our weaknesses, but was in all points tempted _______________ we are, yet without _____________. Let us therefore come __________________ to the throne of grace, that we may obtain _____________ and find _____________ to help in time of need” (Hebrews 4:15-16).